Our Endodontist, Dr. Batheja, is a Board Certified Endodontist with over 10 years of experience. He completed his dental school training at UCLA and a General Practice Residency at Cedars Sinai Hospital. He then finished his Endodontic residency at USC school of dentistry and has been practicing in Los Angeles ever since. Dr. Batheja is a Diplomate of the American Board of Endodontics. Only 12% of all practicing Endodontists have been earned this honor. We are proud to have him treat our patients here at Ocean View Dental Group. 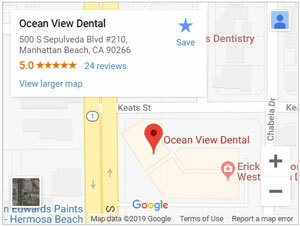 "Started going to Ocean View Dental a few weeks ago, needed cosmetic dental work. The office location and staff are great. Super friendly and nice. The doctors were caring and kind. They worked with my PPO insurance and also referred me to their orthodontist. Very professional." "Use to come here 3 years ago and came here for a broken tooth today. They called Ocean View Dental under new management. New Doctors are great. Saw me same day and took care of me. Place looks great. Overall a great experience and highly recommend them.."